This is the story of the "other" Thomas Edison -- not the heroic lone inventor, but Edison the businessman, industrialist, and successful manager of one of the world's largest industrial research laboratories. Tracing his career from his boyhood to his death in 1931, Edison and the Business of Innovation reveals Edison to be an entrepreneur of extraordinary vision. From extensive research in the Edison archives at West Orange, New Jersey, Andre Millard presents new information about Edison the businessman and provides new interpretations of old issues. This book works to cover the evolution of research and development within the American corporation. Borrowing from the understanding of Alfred Chandler it tracks through the machine shops days of free flowing ideas to building up a business based on the innovations developed in R&D. This is not a biography on the life of Edison but it is a biography on his business ventures. While not going into exhausting detail, it is possible to see what developed in the Edison labs at the end of the Gilded Age. The companies that survived through the panics and great depressions were those that had their own R&D centers (GE, Westinghouse, RCA, ect). Their efforts at creating a mass production system that could handle all of these new inventions is followed from the stories in this book. The Old Man (Edison) is truly the father of so many inventions that are all chronicled here. The book goes through those that became a success such as generators and phonographs or the ones that became a failure such as the Ore separation business. The drive with which Edison entered all of these businesses was amazing and well worth looking at in further detail. This is a great book for those who just want an overview of the age of innovation. 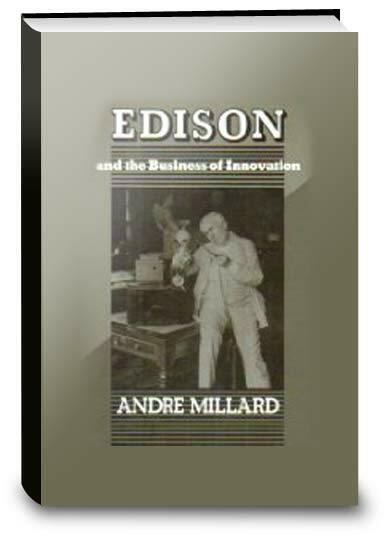 Click the button below to add the Edison and the Business of Innovation to your wish list.